After decades of building an alternative visual narrative for the black community, a senior Reverend seeks to preserve its monumental legacy before his impending retirement. David de Rozas is an independent filmmaker based in California. His interests relate to the politics of history, memory, and identity through a range of mediums and formats. His practice combines audiovisual research, film production, and curatorial projects. These include art center displays and program strategies, lectures, film programs, documentaries, written and film essays, and other forms and sites of knowledge production. David earned an MFA in Cinema at the San Francisco State University, and BA in Fine Arts from the Complutense University in Madrid. His projects have been recently screened and displayed at the Winnipeg Underground Film Festival, SOMARTS, UCLA, CSU Media Arts Festival, FLEXfest, Artists' Television Access, Southern Exposure, and the Prelinguer Library. He is currently Curatorial Assistant at Los Angeles County Museum of Art (LACMA), and lecturer at SFSU School of Cinema. San Francisco, once considered the epicentre of counter-culture in the United States, has changed dramatically since the Silicon Valley tech boom. The once called ‘49 square miles surrounded by reality’, slowly started to disappear 10 years ago under the shadow of the global technology industry. Property speculators and gentrification have inflated the housing market, generating the displacement of local businesses, non-profit organizations, and countless individuals, irreversibly altering the demographics and culture of local communities. I met Roland Gordon in 2004 while I was doing research for a short film. I was attending a series of Community Committee meetings in Ingleside, a southwestern neighbourhood where he serves as a Reverend. He agreed to an interview, and we met some weeks later at his church and community center, a large three story building built a century ago. It was my first visit to a church in the United States. Before leaving he invited me to see something else. Through a small corridor he took me to an interior basketball court, approximately 30 ft high. 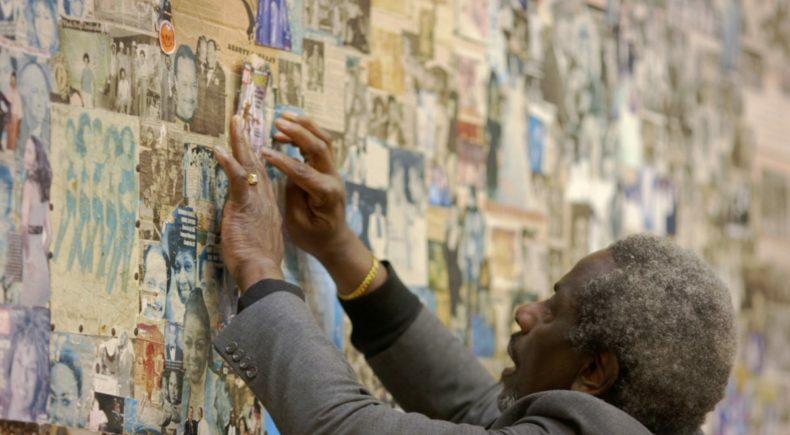 Except for the floor and the ceiling, the walls were completely covered by an immense collage conformed by portraits of famous and lesser known African Americans, cut out from newspapers, magazines, photos, and photocopies. I was shocked and completely taken away by the place. Soon after I learnt that, with the exception of the sanctuary, the whole building was completely covered by portraits of black people. When Roland explained that his motivation for doing this monumental visual archive was to offer a ‘you can do it to!’ inspiration for the black youth in his community, his work acquired another dimension. Since that day I started a dialogue and collaboration with Roland, that has resulted in this film. ‘GIVE’ continues an ongoing research about the encounters between memory and history. Started in the early 1980’s, Roland’s immense collage aims to present and portray an alternative history made for and about the black community. Capturing memories of the African-American culture in the US and beyond, Roland’s ‘Cloud of Witnesses’ challenge any authoritative and absolute conception about ‘national history’, by inquiring, playing, and negotiating the US past and present racial inequalities. Roland’s work is not the ‘Black History’, but his personal understanding of it; a history in its own right. A multi layered, diverse, and sometimes contradictory fabric that conforms centuries of African American culture. By exploring other possible imaginaries, Roland’s gesture opposes traditional authoritative representations about the absoluteness and the continuous, and the personal versus the institutional, by imagining and inventing new truths. As part of my methodology, I accompanied Roland to a series of Historical Preservation Commission meetings at City Hall, where the status of Historical Landmark was being discussed for his artwork. These meetings were particularly meaningful, as the Ingleside neighborhood black population had been reduced from 70% to less than 5%. This succession of meetings became part of the research process, and helped to script some of the scenes. The final film comprises both materials from this documentary process, as well as scenes scripted after conversations, participative observation, onsite audiovisual fieldwork, and research at local libraries and city archives. The film has three main goals. First, to share a “Cloud of Witnesses” as a unique critical perspective and gesture of resistance, that has inspired many generations of neighbours, as well as myself. Second, to combine fiction and documentary through a multilayered timeline that covers almost a century of the building, the neighborhood, and Roland’s community history. The film does not escape this reality, but aims to create a complementary one. Third, to give to the whole story an organic and magic quality, that reflects the nature of Roland’s work as an ongoing collage-archive. In this sense, I played with the overlapping materiality of images in the collage, that range from the analog and the photocopy, to the digital; from the black and white to the colored; from the older ones already blurred, decolored and closer to disappear, to the sharpness of the recent ones; a language that reflects the qualities of an artwork started three decades ago; a language that evidences the relationship between time and image. I'm not a black individual, nor a religious one. I was a guest in Roland’s community, as I am in this country. I understand that cinema it’s not about looking for questions or about finding answers. It’s about reacting by interrupting an order, inhabiting and making experience, constructing and creating contexts, and about thinking, sharing, and challenging knowledges. I believe this is where Roland’s artwork and my own practice comes together; by channeling art as a tool for individual empowerment and social transformation. During the last decades, Roland has been making something exceptional from images that are already beautiful. He gathers and takes care of black bodies. GIVE is a film about the act of sharing without expecting nothing in return; about the love that we share for those who inspire us, fighting for justice, equal education, and civil rights in the US and beyond. GIVE is a film about the daily generosity of individuals whose efforts and work aim to make this world a better place for everyone. GIVE is about my friend Roland, the teacher, not the preacher.